The anniversary of September 11th was just another school day for millions of 9th graders who were not even born when the attacks on New York and Washington occurred, leading the the death of thousands over the 16 years since. Because they have no personal memories of the event, teachers may struggle to find meaningful ways for the current generation of teens to connect to the experiences of an older generation. 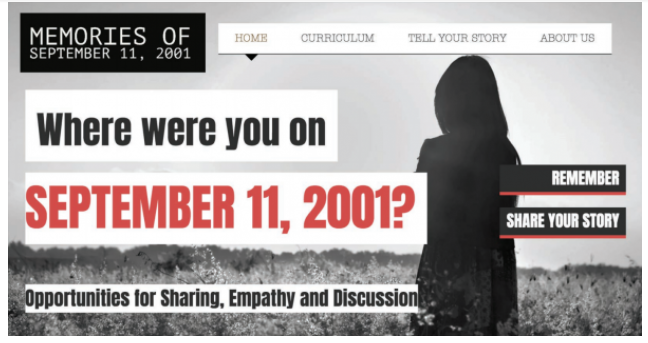 At the Memories of 9/11 website (www.911memories.org), teens can view and listen to people from all over the country who share their memories of the event and respond to them individually using a digital video sharing tool called Flipgrid. After listening to a teacher share her memories upon learning about the attacks in New York City, one student was amazed at how intense and specific her memories are. Another student demonstrated empathy in imagining how she might have felt if she had experienced the news. What stress it must have been, worrying about a brother working in the city while watching the news on TV, unable to reach anyone by phone. Kara Clayton and Carolyn Fortuna, who developed the three-lesson unit to help high school students understand what different people experienced during the attack on the United States, are experienced high school teachers with expertise in digital and media literacy. Working with the Media Education Lab, they created an instructional unit that includes a lesson designed to give students an experience with close reading of both print and video texts. Another lesson asks students to analyze the Newseum’s Front Pages from September 12, 2001. In the final lesson, students have the opportunity to listen and respond to an asynchronous discussion forum using Flipgrid as the digital platform. The website and curriculum materials are free and anyone can share a memory or listen and respond to the memories of others.